The Chinese New Year celebration is symbolic of the Chinese people who Work Hard and Play Hard. For the Year of the Rabbit remember, don't just work hard but work smart and you will surely be prosperous and happy! Some rhapsody of Chinese New Year songs can be heard by clicking an old family webpage of the year 2002. This is the 10th Chinese New Year celebration from then and one can note reading the family update then and now, how much the family has advanced through time and the different stages of life. First, a reunion dinner on the eve with Mark and Beverly with their 3 children, visiting from Japan where they are living now from their home in the United States. 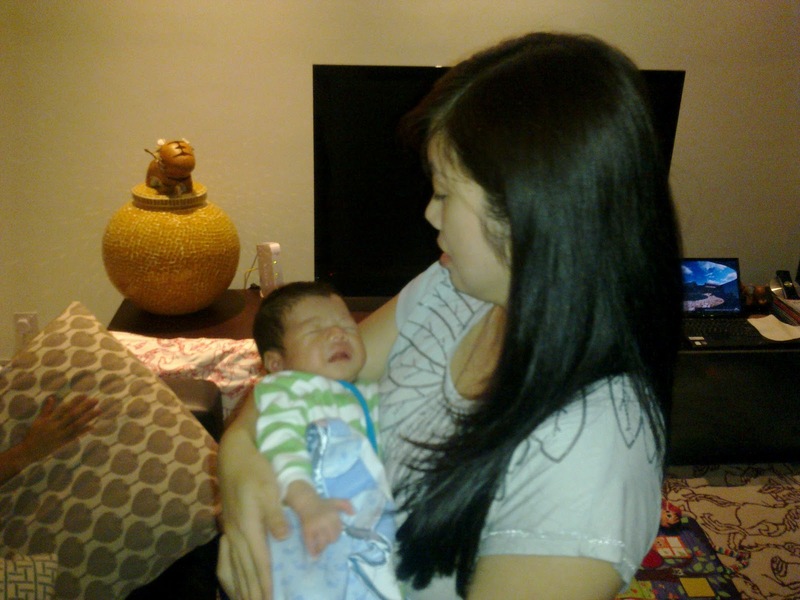 Beverly is the oldest child of Mom's brother Roy Thong. Here is Mom exploring a shop in China town. This is not for our Chinese New Year preparation but more for the coming wedding of Su Min which will be on June 18 this year in Salt Lake City. Before starting on the journey to Singapore, Simba still without a valid visa to follow, needs to be sent to the home of our dog sitter friend. He is happy there with a family with children to play with. The drive to Singapore was clear of heavy traffic with a rainbow amidst dark clouds in the horizon. Fortunately the North-South highway to Singapore was not affected by the floods that had occurred in a few towns in the southern state of Johore. This local flood experience and the other occuring in Queensland Australia where we have friends made me add another link of community interest to my website under the heading of Global Climatic Change. Mom received a phone call later too with sad news from our former maid in Indonesia that her home was like in a sea, meaning it's flooded, yet her home is no where near the sea. Let us hop back to the scene in Singapore. 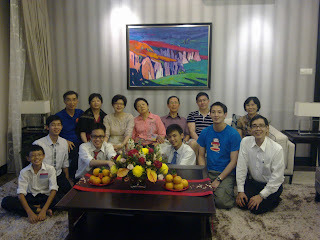 It was nice to catch up with some of these relatives whom we have not seen for quite a while. It also helped us to update Mom's side of our Family Tree . Pictured above is mainly the children and grand children of Mom's oldest sister who is deceased. As in all Chinese New Year celebration, the children look forward to get their red packets or 'Ang Pow'! We also have reunion with friends like Dixon and Chelsea who used to be our close neighbors and our first vistors on Christmas of 2009. They went back home to Utah for Christmas last December, a state with people who have touched our hearts like Chelsea's parents who offered their home to us to host Fei's Wedding in Utah in May of 2010. Dad is also happy to receive visits from his special group of friends. There was also time to visit my 4th brother and his wife's family who are also Singaporeans. The Celebrations end with 'Chap Goh Meh' , the 15th night into the Chinese New Year. After dinner, we proceeded into our unique family tea ceremony tradition described in an older post ﻿. Back in Malaysia, I was treated dinner with a nice change of menu in the form of Banana Leaf rice in an Indian restaurant. This year, ﻿our celebration and family reunion was mainly confined to Singapore. In past years we would alternate each year between Singapore and Malaysia. Since my father's death, we now have reunions mainly in Singapore. 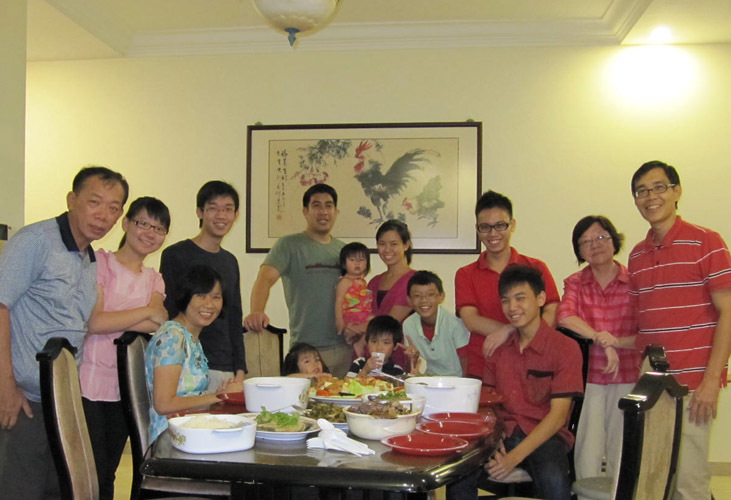 Other than my 4th brother whose part family is in Singapore too, we miss a Chinese New Year reunion with the rest of my extended family members in Malaysia. Who they are can be viewed by clicking blogs of previous years' reunions below. For some the reunion may be due to a wedding and some in unhappy events of a funeral. .... his resting brain state! 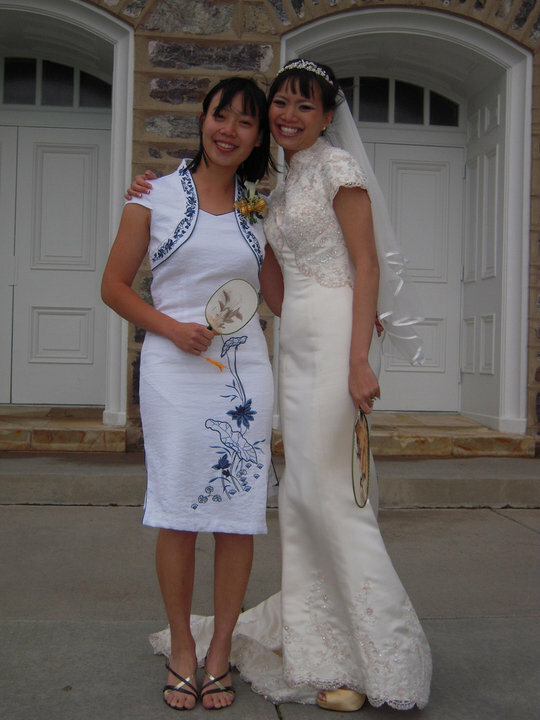 Of course, we miss our two girls dearly who were last seen together during Fei's wedding in May 2010 held in Utah, USA. It will be Su's turn to be married in June 18 this year and we're working on getting the whole family together for the first time in USA for the Big Event!﻿ Hope some more extended family members can join us. Have a hopping time of joy for the rest of the year is my wish to you all, remembering to always Work Hard and Play Hard, but not just work hard but Work Smart!